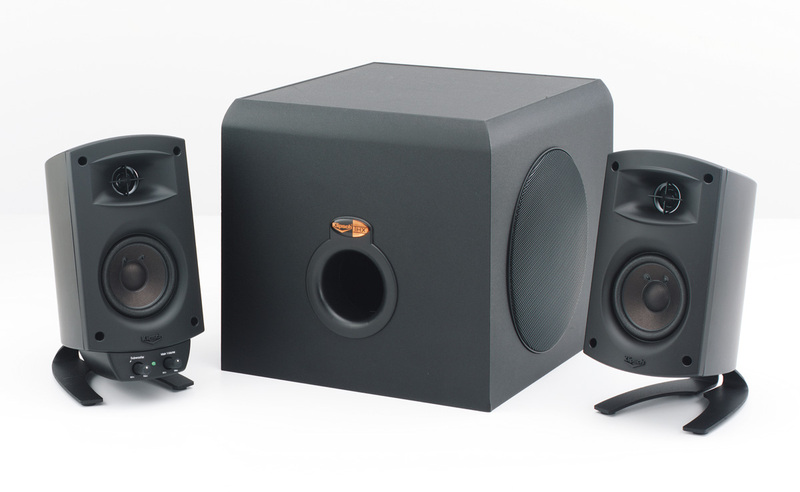 Update: The Klipsch 2.1 Speakers are now available in Australia for a much reduced price. MicroDirect is supplying these units for $299 AU. NB: The Australian version has a different speaker appearance than the ones provided for the 2.1s on the Klipsch Web site. Digital-Linear Hybrid. Designed for high efficiency and maximum output power, utilizing discrete, linear output transistors and high current power section. The result: extended dynamic headroom. Bass-reflex MDF enclosure with front flared port and side-firing active 6.5� driver (long-throw design). Flared, tuned port for enhanced bass coupling and deepest system tuning. Sixth-order bass reflex design allows high acoustic output and low distortion bass response while minimizing driver excursion. Sealed elliptical enclosure made of high impact polystyrene is a 2-way system with .75-inch polymer dome tweeter mated to Micro-Tractrix horn. The midbass driver is a 3-inch long-throw design with an advanced fiber-composite cone and black urethane surround for reliability. (1) Attached 1/8� stereo mini-plug cable receives signal send from PC soundcard; Also compatible with any 2-channel (stereo) mini-plug jack from mini-stereos, game consoles, or video components. (1) MP3/Aux 1/8� stereo mini-plug line input (on side of volume pod) for personal audio players. (1) Headphone jack output 1/8� stereo mini-plug (on side of volume pod) for private listening. (1) DIN plug cable; signal send to power amplifier mounted within subwoofer. Currently Altec Lansing and Cambridge Soundworks dominate the Australian multimedia speaker market, which is a pity as even though they are two reputable brands, many equally or better performing systems get left out of the equations. The Klipsch Pro Media series has been out in the US for around 2 years and has received shining reviews from all around. The system has only now just been released in Australia. Currently it is only available here in the 2.1 configuration, with an expected release date for the 4.1 at around early June. The first thing to note is the extremely high-powered 200-Watt RMS system � higher than any competing system out and comparable to that of Hi Fi and Home Theatre systems. The output is divided into 130W for the sub, and 35W to each satellite. While some companies may use tricks to increase the listed RMS levels and create a false impression about volume levels and quality, it is good to see that Klipsch has matched the level of quality of the system as high as they have set the power output. The Pro Media system is also THX certified, exemplifying their high quality standards. The Pro Media 2.1 comes with 2 satellites and one amplified subwoofer. The subwoofer inputs from the satellites are not in the form of stereo plugs but rather in the form of positive and negative colored wires for each of the satellites, which need to be independently plugged into the rear of the subwoofer. The right satellite comes with the controls for the subwoofer volume, and main volume, as well as the cable to connect into the sound card line out. A mark around 10 o�clock represents the recommended optimal subwoofer volume. The power switch is located on the rear of the subwoofer, which can be somewhat irritating to turn off if you consider the ideal position of a subwoofer would be underneath a table along an edge or corner of a wall. A headphone and auxiliary input jack are located on the right satellite, and are definitely a welcome addition. It is encouraging to see that some companies are actually seeing the general sentiment by customers that they do want these features implemented into the systems. The dual 6 ½ subwoofer is also among the very best multimedia ones out, with tight, warm bass which can be exaggerated strongly enough to make the walls feel as though they were throbbing like a heart in tune with the beat of the audio track. The subwoofer unit has a fairly high amount of heat dissipation, but this is to be expected with a high-powered 200 watt preamp. When attempting to test the maximum volume of the speakers I found myself edging back from the speakers to avoid the pressure on my ears due to their loudness!